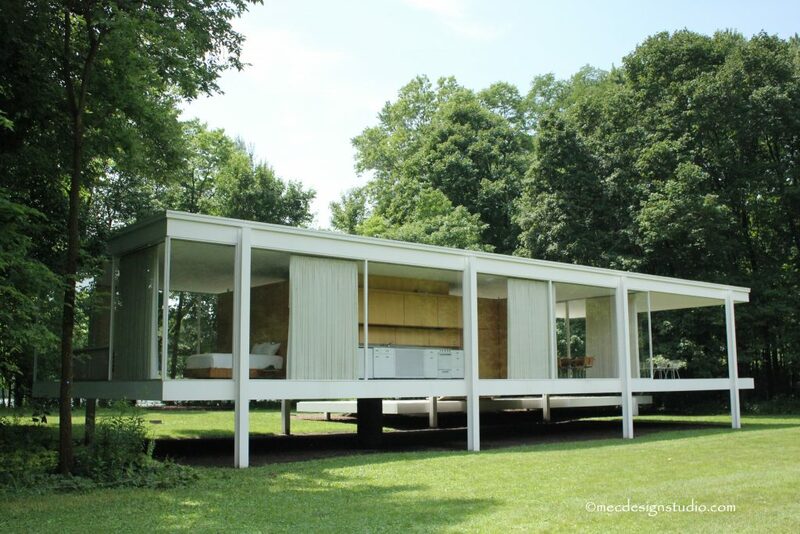 I recently visited the Farnsworth House in Plano, Illinois. I seek out historical homes and house museums whenever I’m on vacation or passing through a city or town. 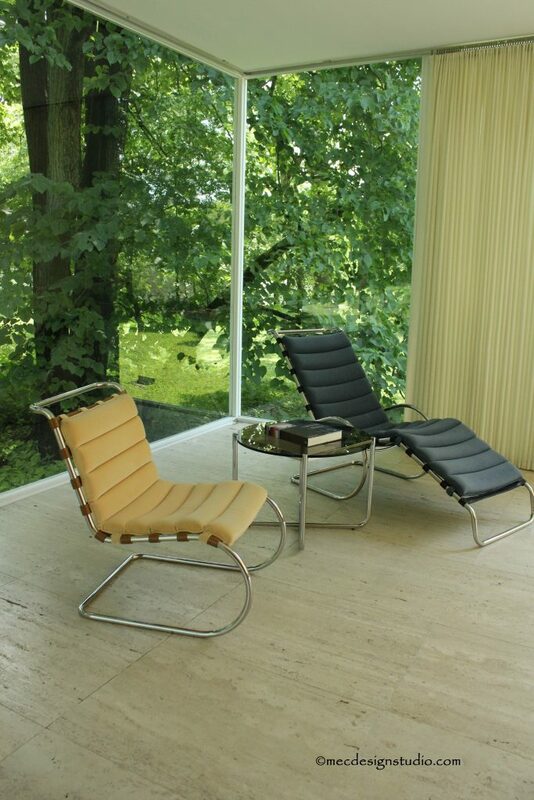 This one, designed by Mies van der Rohe after World War II and built in 1951 is a hidden gem surrounded by corn fields. Really thousands of acres of corn. Dr. Farnsworth wanted to get away from the city and she did! This all glass and steel house built in the International Style is 5 feet 3 inches off the ground. It’s set on several acres of wooded land facing the Fox River. Unfortunately the river flooded 6 times since 1954. 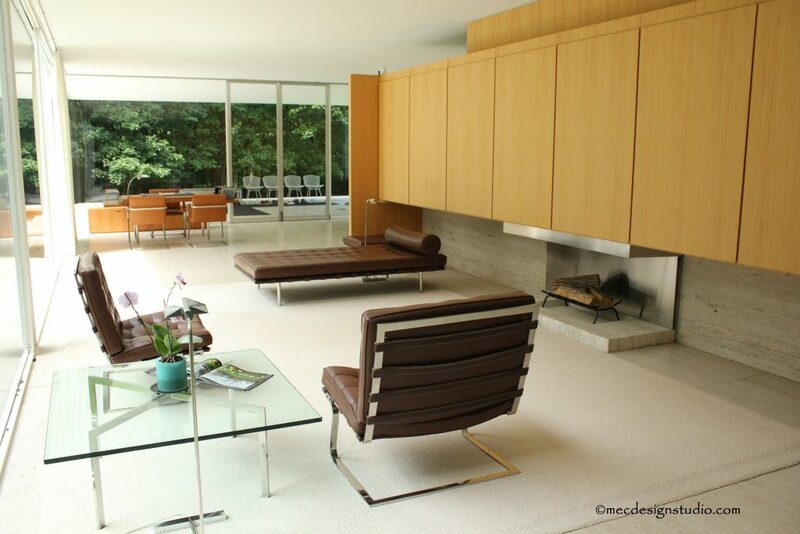 Today the living room features furniture designed by Mies, although Dr. Farnsworth brought her own sofa, chairs and tables when she moved it (and it was awful!). 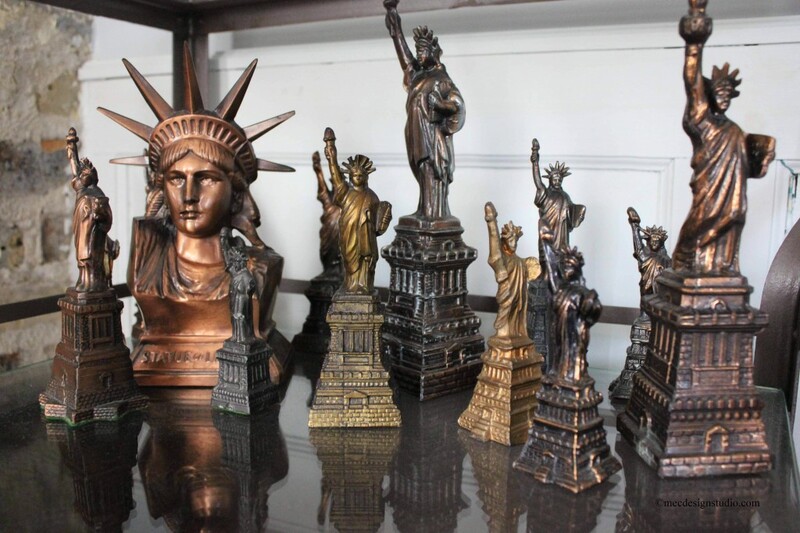 The story of the house is a fascinating one. Cost over-runs lead to law-suits and and a falling out of their relationship. 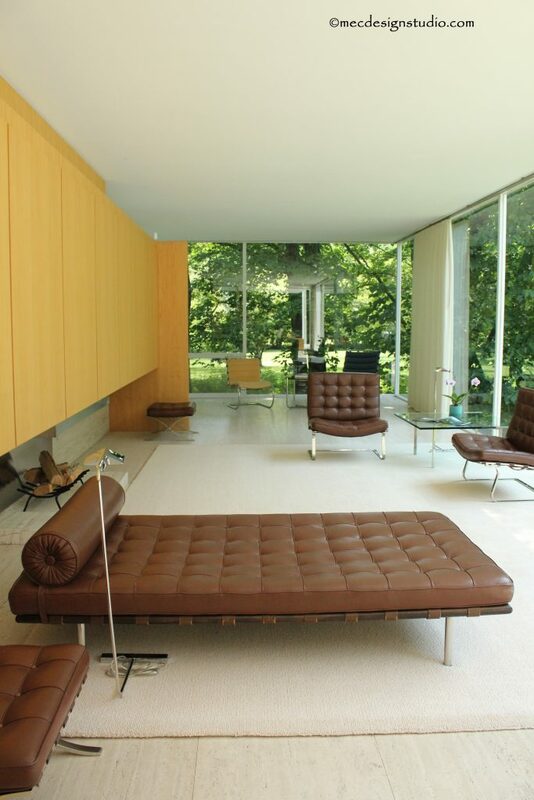 Mies won the lawsuit (Farnsworth had to pay), but they never spoke again and he never set foot on the property after it was completed. 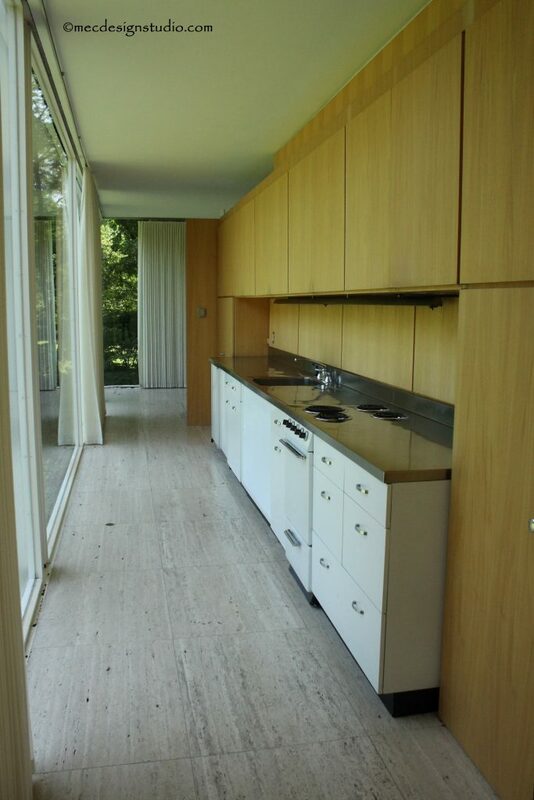 With floor to ceiling windows, the Farnsworth House feels like you’re living in a tree house (although a short one). The draperies are not original, but similar to what the architect planned and can be open and closed in sections allowing you to control the light and privacy. 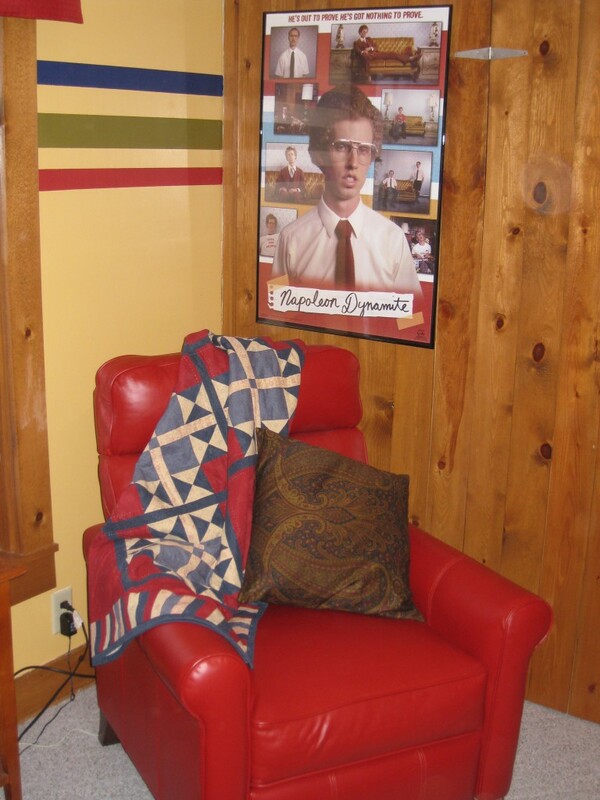 Behind this beautiful paneled wall are two small bathrooms. There are NO closets or storage except for the kitchen cabinets. Where would a woman put her shoes? The galley kitchen has bragging rights to having the first ever stainless steel counter top made in one piece! There are no seams. The sink and backsplash are integrated into the design. Every commercial kitchen has one today, but in the early 50s, this was quite an engineering feat. You can see the bedroom at the left of the kitchen. No walls or privacy, just a bed. 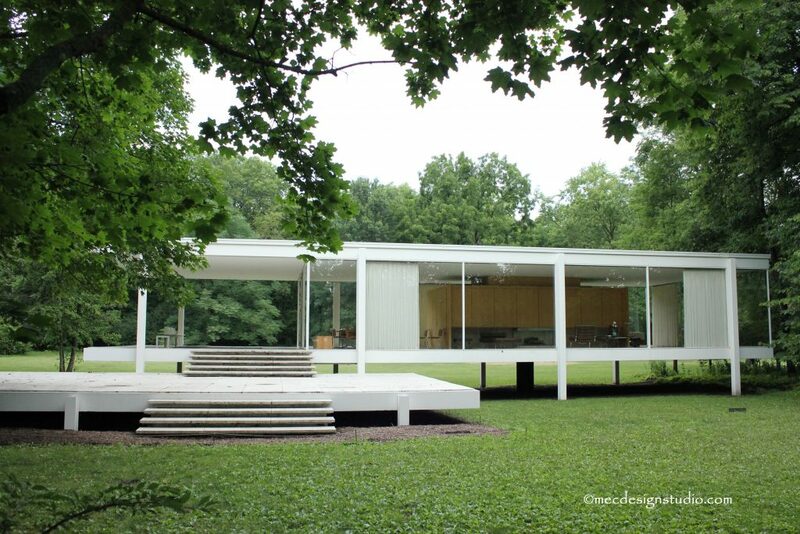 We’re really lucky to have such an iconic piece of architectural history in the Midwest. It’s worth the trip and you might find a corn stand along the way.